Volunteer in your loved one's athletic training. 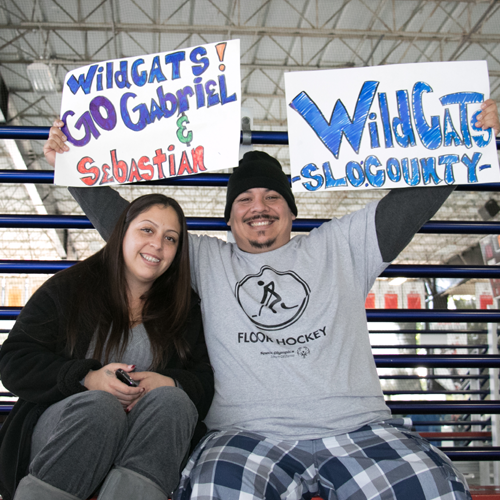 At Special Olympics competitions, family members are among friends — and feel at home. They watch with pride as their child, sibling, cousin, grandchild, aunt or uncle find success and joy. Share ideas, issues and common interests with other families. Among people who really understand, even family members can be unaware of all that their child or relative with an intellectual disability can do. 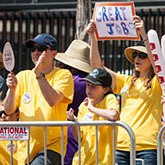 Fans in the Stands gives friends and families the opportunity to cheer on athletes as a valued spectator. Start a program through your local regional office. Contact your regional office for information. 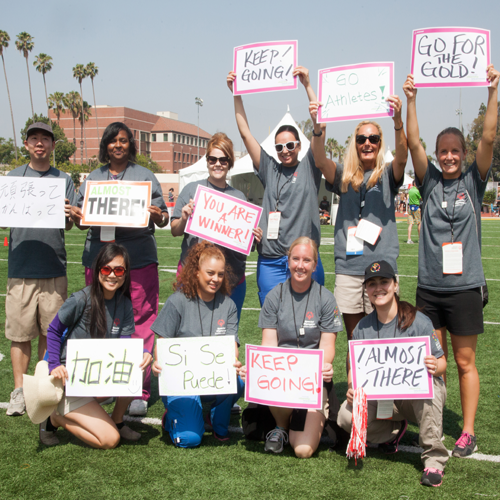 Special Olympics Southern California would not exist today without the expertise, time, and enthusiasm of its volunteers. They are on the sports field guiding the athletes through drills. They are behind the scenes ensuring events run properly. And they are giving and receiving more high fives and hugs than they can count. What does Special Olympics mean to our family? How did Healthy Athletes Change My Daughters Life? While attending Southern California Special Olympics State and Fall games through the years I have noticed the growth and support of the Healthy Athletes Program, being a very involved parent, who takes her children to many Doctors appointments, I would look at the Healthy Athlete program as a good idea for those who may not get the needed medical attention they should. Boy was I humbled at this last fall games. My daughter Vanessa had been showing signs of becoming far sighted and I told another coach that Vanessa is difficult to test so if they have healthy eyes I would like them to test her vision, I thought that they would be the best prepared to test someone with intellectual disabilities. We waited in the very long line and Vanessa did the first stage of the eye tests with some of the other athletes, at the end of the initial screening a very nice gentleman said that he would like to further test Vanessa at the inner station but the wait time was almost 2 hours, he suggested I please bring her back first thing the next day and they will test her and our other athletes. Not expecting anything I agreed and although the next day was busy I took her back. 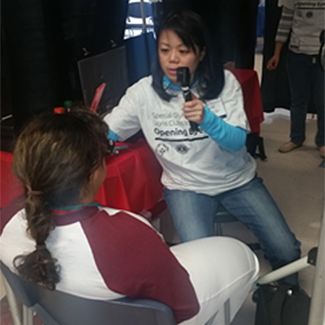 To the best of their testing at the temporary facility they informed me that it appeared Vanessa may have cataracts and that her eye sight is very bad. They said she appears to be extremely near and far sighted and that I should take her to an ophthalmologist for further examination as soon as I can, I was shocked and felt horrible as a mother. Vanessa did see an ophthalmologist and because of Healthy Athletes it was discovered that my daughter needs to be taken to Jules Stein Eye Institute at UCLA because her corneas are failing and my baby needs both corneas replaced. Because Vanessa has had so many medical issues she learns to adapt and apparently that is what she was doing as her vision was failing. Had Healthy Athletes not alerted me to a problem Vanessa’s vision would have just completely and rapidly deteriorated. This entire experience humbled me as a woman, a coach and mostly as a mom. We can provide our children with the best we have but sometimes the best we have is the other people in our lives that are there to help us like Special Olympics and the Healthy Athlete’s program. 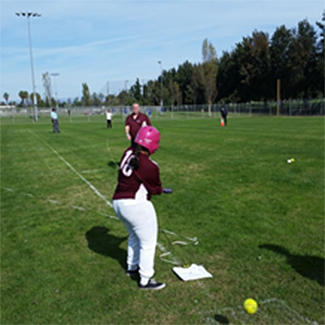 I can’t wait to see my daughter hit a softball because she tries so hard to do it and now I know the reason she can’t is because she can’t see it. Thank you Healthy Athletes for changing my daughter’s life, because of the program my daughter will one day see clearly and be able to experience the Special Olympics programs she loves so much in a whole new light. 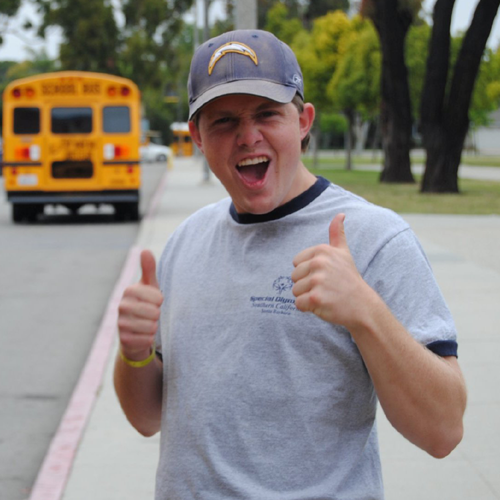 I enjoy participating in Special Olympics because it is always encouraging me to do my best. When I compete, I feel like I’m in a movie about acceptance and courage. I've had some pretty bad things happen to me in most of my life. Special Olympics has helped me learn how to stand up for myself in real life and conquer my fears. What Special Olympics does for us is gives us self-esteem. It taught me about myself and how I can accomplish my dreams. People say I can’t do certain things because I have an intellectual disability but that’s not true. Paul Hoffman has competed in Special Olympics for more than 30 years and is passionate about the changes sports have made in his life. Not only has athletics made him a healthier person, but it has given him more self-confidence and a sense of pride.